We have a general meeting about every couple of months, a work party on Sunnydale Park about every first Saturday of the month, and a work party on or near Griffe Field Park about every third Saturday of the month. 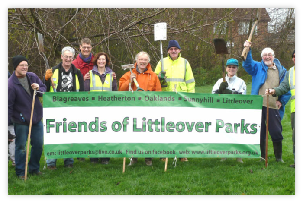 Our aim is to maintain and improve the Parks in Littleover for the enjoyment of the local people and for biodiversity. If this is your ‘bag’ then do come and join us. The more the merrier and the more can be done. 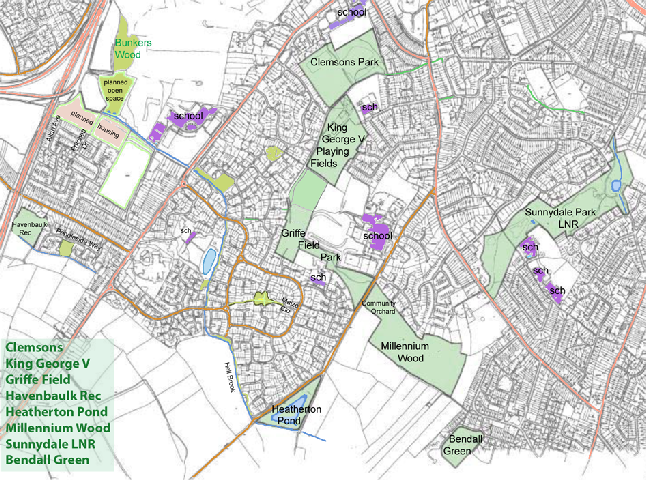 We are aware of new developments in and around Littleover and the threat to existing green space and the prospect of two or three new parks. Could you help us be-friend these spaces ? We do more than work with forks, secateurs, and litter pickers. If your skills are more in propogating from seed, developing information leaflets or smart-phone apps, or identifying species, then we have lots of ideas for ways that you could contribute to the parks life and enjoyment. We have a constitution, an equal opportunities policy, and we produce various risk assessments - to help guide the way we do things.